Upon coming back from break, Respond, UT’s undergraduate research journal, was ready to start planning their next issue to release later this semester. 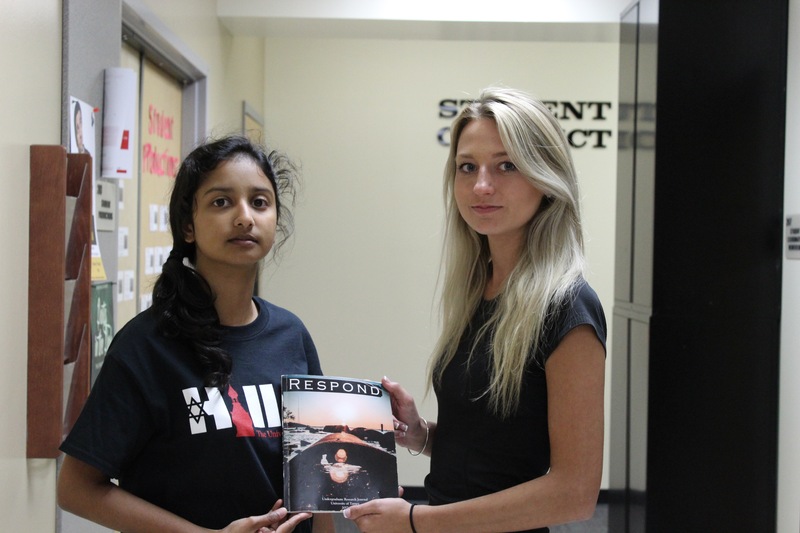 Both editors-in-chief of Respond Alex Sullivan, junior biology major and Kamakshi Dadhwal, senior psychology and philosophy major, never anticipated this could be the last issue of the journal to release. In Respond’s 15-year history, the organization has remained under the funding of the Honors Program and has been known as the Honors Program undergraduate research journal. But, Dadhwal and Ryan Cragun, director of the Honors Program and associate professor of sociology, discussed the upcoming issue of Respond when Cragun explained that Respond would lose funding from the Honors Programs budget effective Fall 2018. To keep Respond afloat, Sullivan and Dadhwal and current adviser David Reamer, associate professor of English, will have to see how Respond can move forward. Currently, it is run under the Student Media Committee like The Minaret, WUTT, UTTV and Neon to help choose the top editors for each school year and create order. Respond will now have to apply for funding under Student Government like other organizations on campus. There was no formal meeting held about Respond to announce the decision was made, according to Dadhwal. She also said Cragun explained to her when discussing the matter that honors students’ work wouldn’t be something they could use after some of the students attend graduate school. Respond struggles on a yearly basis to get submissions for their annual publication, so it’s easy to see why the Honors Program would want to cut it, according to Dadhwal. The original plan for the Honors Program was to replace Respond with Replicate, an undergraduate journal dedicated to replicating peer-reviewed published studies, according to Cragun. Cragun’s idea to start the replication journal has since not been further discussed with no plans to make it an official Honors journal. When stepping into his role as honors program director in Fall 2016, Cragun realized Respond was in a weird spot. Cragun said most honors students are pursuing a graduate education after finishing their undergraduate studies. For the honors students that do, he can’t give a definitive answer of whether Respond will help make a case for their graduate studies. Ashley Morales Pacheco, senior political science and psychology major and submissions editor for Respond, said she was shocked to hear the news from both editors-in-chief. It’s up to the current editorial staff to make sure it’s available for the next generation of editors, according to Morales Pacheco. Morales Pacheco said Respond has helped her grow as an editor and writer and has learned the best practices by editing and effectively writing a research paper. Every meeting has been a fond memory and has offered valuable experiences with other editors, according to Morales Pacheco. David Reamer, associate professor of English, said Cragun and Tillman did not consult with him prior to making the decision to defund the journal, but Reamer reached out to them when he started hearing rumors. Reamer believes the journal still has much to offer whether it’s tied to the Honors Program or not. If Respond can secure a set-in-stone direction of where the publication goes from here, Reamer is confident this won’t be its final publication. “UT supports student research both intellectually and monetarily, and if we have a clear vision for, and explanation of, how we further that mission, I am confident that Respond will still have a home here,” Reamer said. To keep Respond alive through Student Government, the key is time and going through the process, according Tim Harding, associate dean of Career Development and Engagement and adviser of Student Government. The organization will also have to go through the Student Media Committee (SMC), which can help advise the publication in which direction to go for funding. Jeffrey Neely, current chair for the SMC and assistant professor of journalism, said Respond became an official publication governed by the SMC at their Spring Meeting in 2017. Dadhwal believes the content will change and Respond will not be the same once it is officially defunded next academic year.